2017 has been a busy year for us. On March 11 we successfully launched Resnik, the first rocket manufactured entirely by us. It reached a maximum speed of 1000 km/h – 80% of the speed of sound – and an apogee of 1930 m. This rocket probably set a new altitude record for amateur rocketry in Spain. This mission, named after Judith Resnik, an astronaut who lost her life in the Challenger, helped Cosmic Research enter the path to the new student space race we are living. Unofficially, several teams of university students from around the globe race to be the first to launch a rocket into space. Some of these universities are the University of Southern California, the MIT, DELFT (Netherlands) etc. Our intention by sending a rocket into space is no other than to democratize knowledge about rockets and inspire young people. 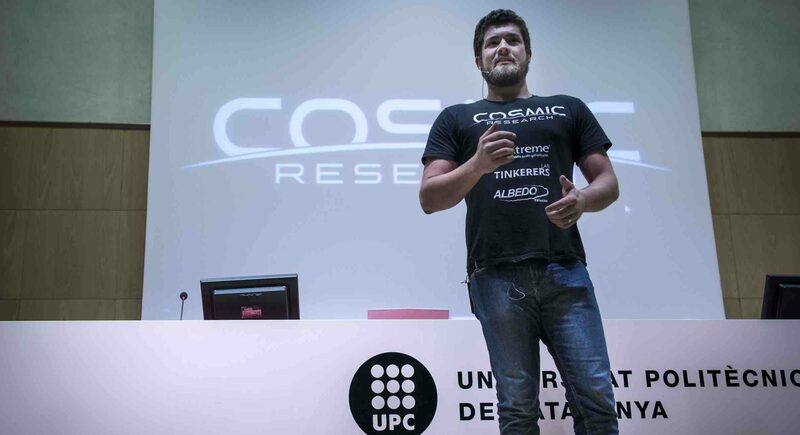 Going back to 2017, on May 17 we publicly presented Cosmic Research in our university: The School of Industrial, Aerospace and Audiovisual Engineering of Terrassa (ESEIAAT). 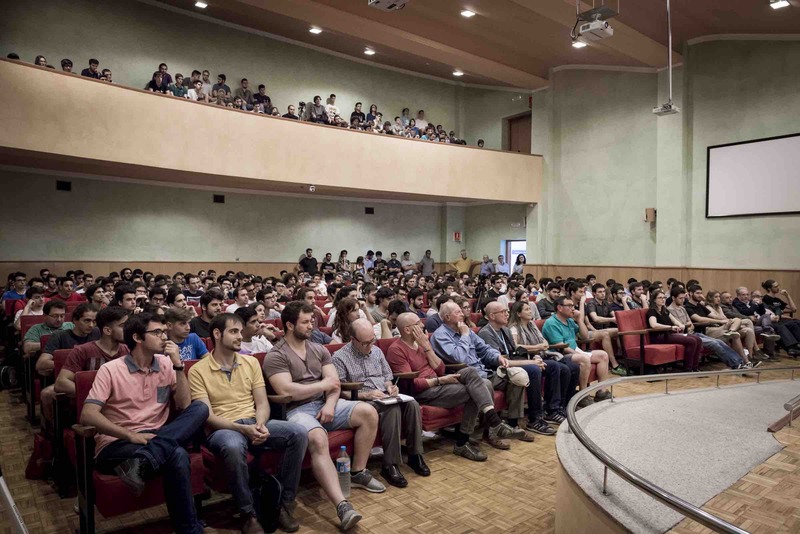 This event was an extraordinary success – we filled an auditorium with more than 300 people! Students and teachers were enthusiastic about watching a group of students work to send a rocket into space. Following that event, we decided to accept applications to expand the team. We received many. The team grow from 5 people to more than 15, and today we are 22. Virtually every seat was taken and some had to remain standing. After our final exams, we trained the new recruits through seminars organized by the older members. These sessions covered stability, propulsion, electronics and more. 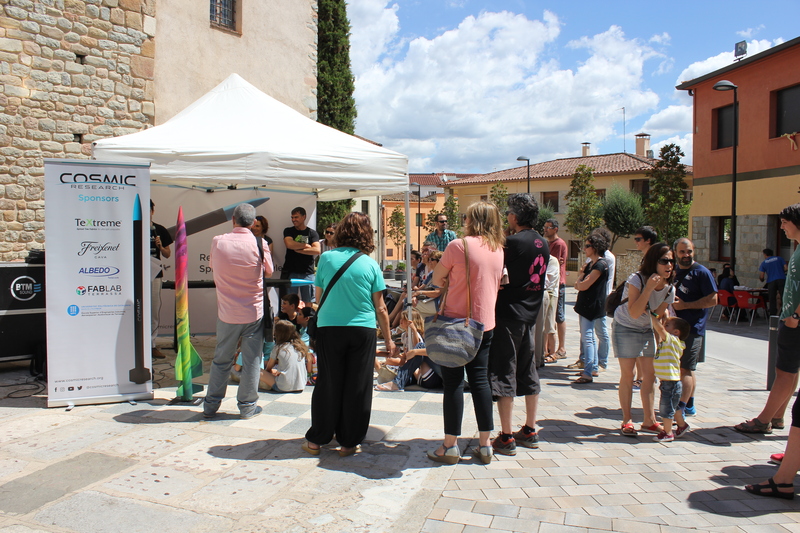 As a practical test, we proposed a mission in collaboration with Institut de Terrassa. Together with high school students, we launched a CanSat device at 1500 m. A modest mission that motivated the students and helped us learn as well. After the summer, we started working on our next rocket, Bondar. Its objectives are to go into the stratosphere (10-15 km) and reach supersonic speeds. In November 2017, we presented our project to the press in a conference held at our university. Announcing our plans to reach space had a huge impact and the national media echoed. We appeared in several of the most read newspapers in Spain, as well as in televisions, radios, websites and magazines. We counted more than 60 appearances. The idea that a group of students wanted to send a rocket into space in 2022 captivated the public. After that press conference, several companies were interested in the project and contacted us to establish sponsorships for next year. In December, we began conversations with an important entity to launch our next rockets from a safe area. As we have already said, 2017 has been a busy year for Cosmic Research – although we will work to make 2018 even busier! Our main objective for this year is to launch the Bondar rocket. It is a supersonic solid-propelled rocket, with a length of 2.5 m, that should achieve an apogee of 15 km. If we are successful, we will be on the podium of European competitors in terms of that student space race. Our initial purpose as an association has not changed. That is to excite and educate the public in space exploration. If you have been motivated or have learned because of us, we thank you. The Cosmic Research team wishes you a happy 2018 and invites you to spread your individual knowledge for the good of all humanity. See you on Earth. 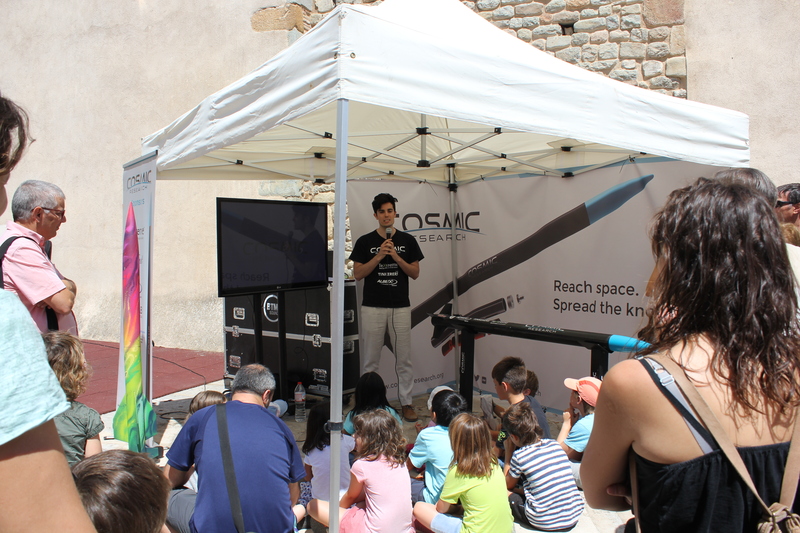 On September 23, Cosmic Research sucessfully launched a Cansat developped by high school students from IES Terrassa. The launcher, a high-power rocket named Ansari, rose 1439,1 m above Alcolea de Cinca, SpainRocektry’s launch site. This launch was part of a mission named before the launcher, whose main objectives were to offer basic training to Cosmic Research’s new recruits and to test Cansat deployment technology. A Cansat tries to mimic the technology used in miniaturized satellites and serves educational purposes. Cansat competitions are organized periodically all over Europe and the United States to promote education about space sciences and excite young students about space activities. 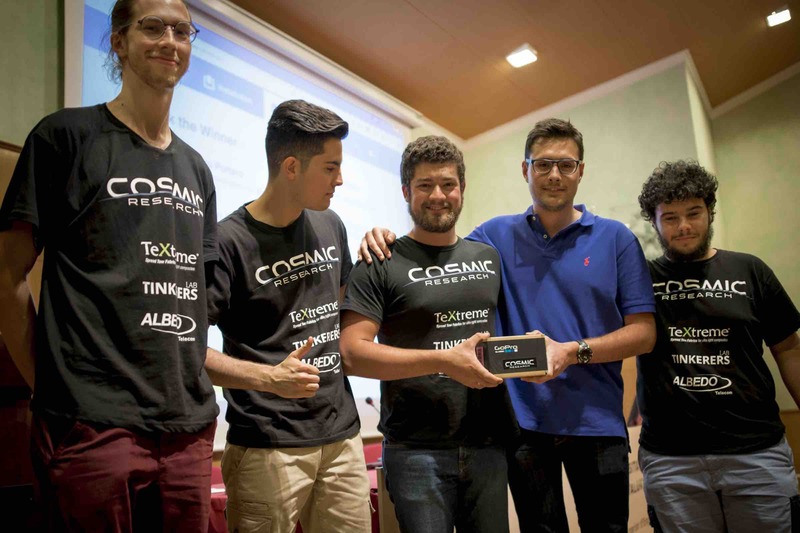 In order to test their Cansat for future competitions, a teacher from IES Terrassa, a high-school in the province of Barcelona, contacted Cosmic Research to establish a collaboration agreement. The Association gladly accepted and started working in a new rocket specially designed for that purpose. 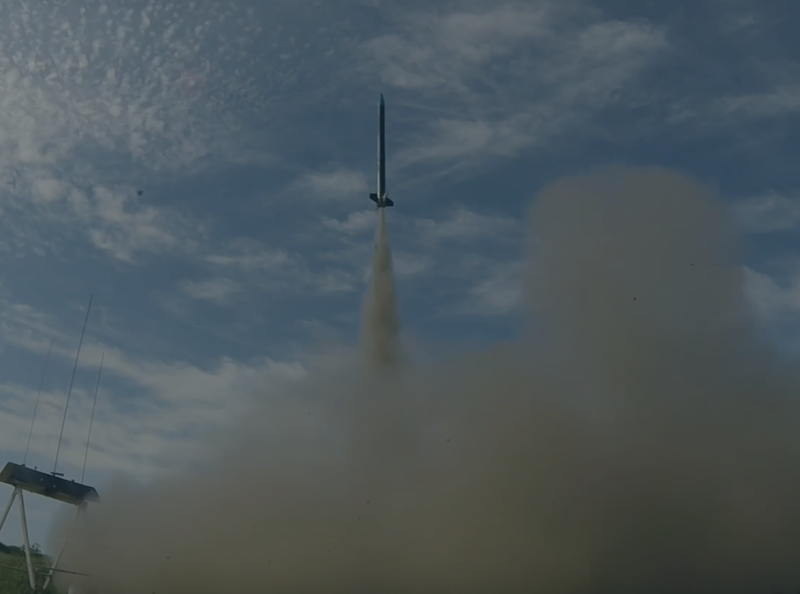 Named after the Iranian astronaut Anousheh Ansari, the rocket was assembled from an Intruder rocket kit by Cosmic Research’s summer new recruits and launched for the first time on August 5. The rocket deployed a mockup Cansat successfully. 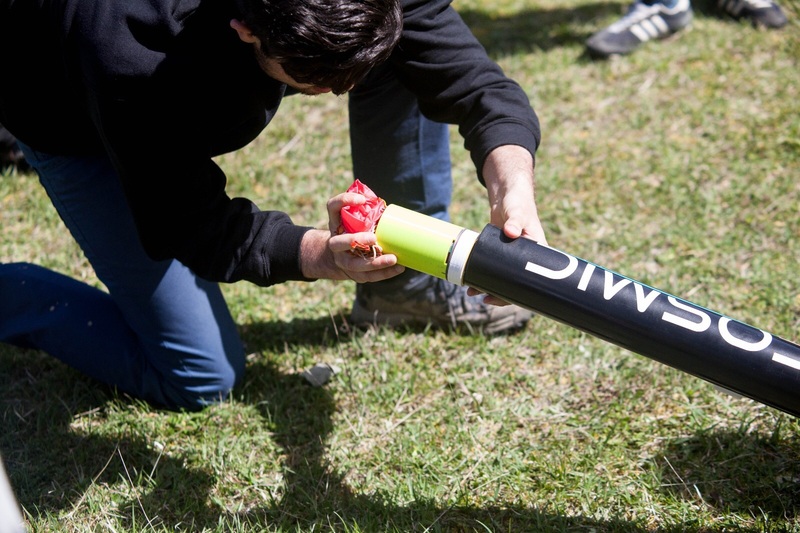 Following the success of this first test launch, the rocket was launched a second time carrying the real Cansat developped by the young pupils. 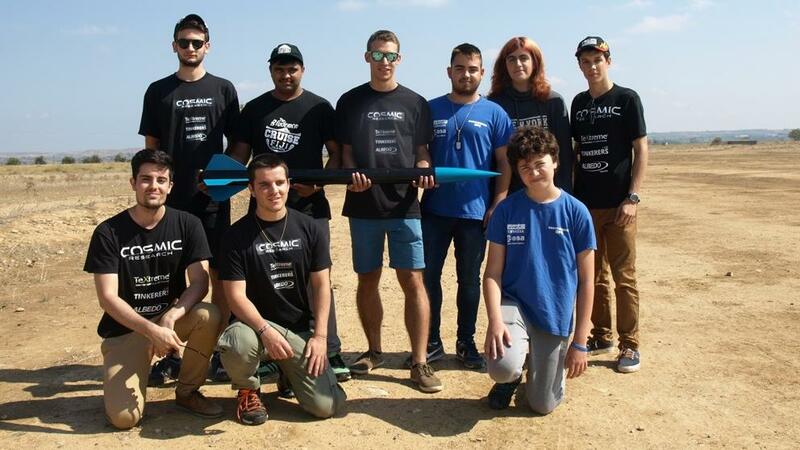 Both teams met again on a rocket day organized by Spain Rocketry, Tripoli’s Rocketry Association Prefecture in Spain. Weather was favorable, with little wind and no clouds. Both junior students and Cosmic members joined forces and achieved a successful launch and a safe recovery. The rocket reached a peak altitude of 1439,1 m above the launch site (221 m) according to the data collected by the Cansat. Then, the rocket separated into two parts plus the Cansat thanks to a pyrotechnic charge installed in the end of the motor. All parts were recovered undamaged thanks to the opening parachutes. 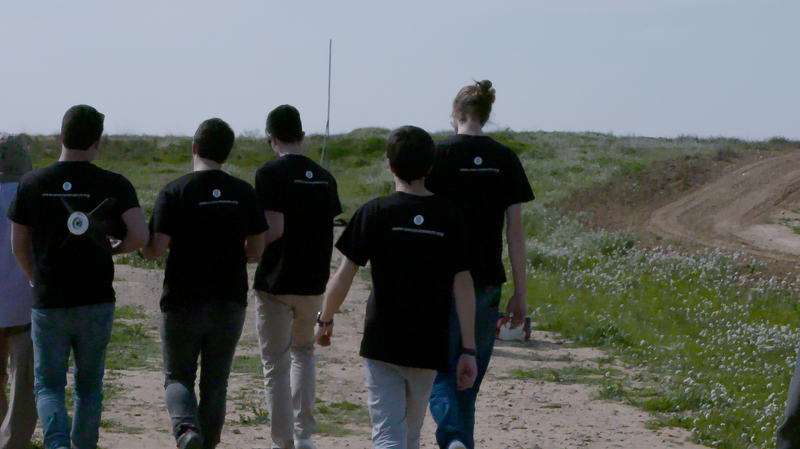 They were located afterwards with the help of the Cansat GPS in a radius of less than 1 km from the launchpad. All participants later shared a meal as conclusion for the rocket day. This mission has been covered by La Vanguardia, el Diari de Terrassa and Nació Digital. 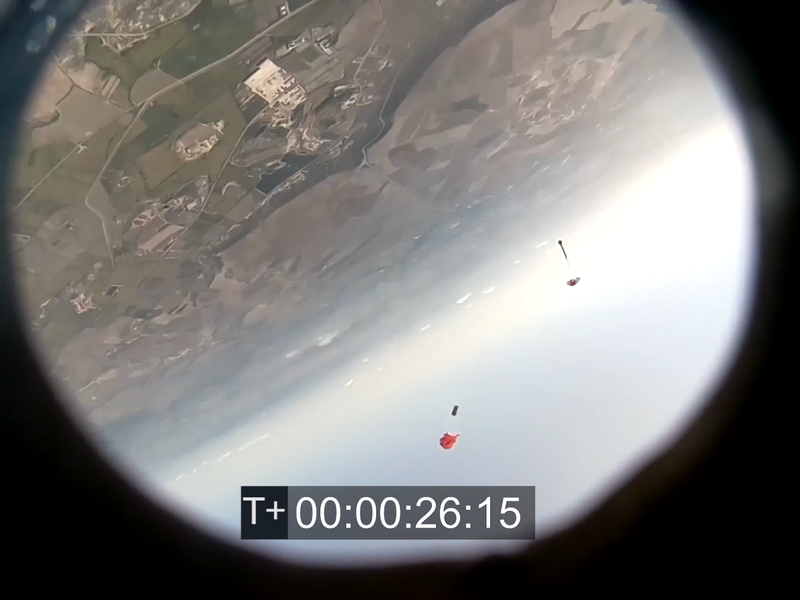 Onboard camera shows the Cansat deployment at apogee. The full video will be published in our YouTube account. 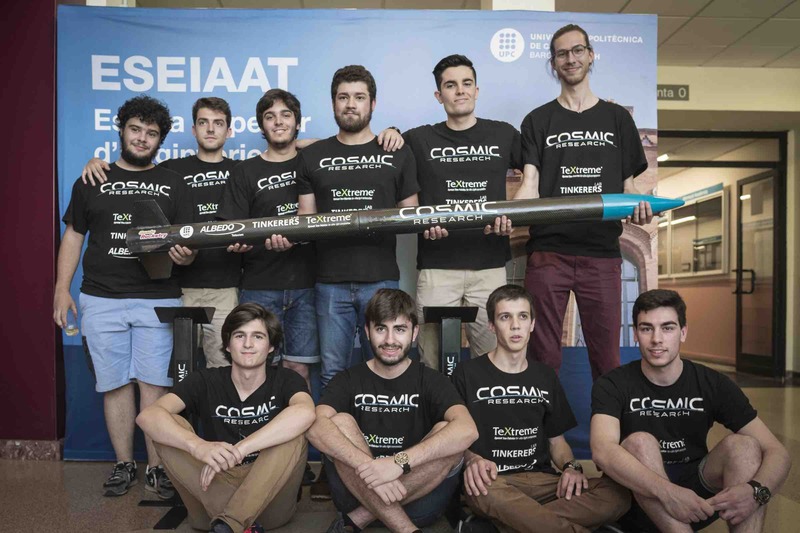 Cosmic members next to INS Terrassa students before placing the rocket on the launchrail. Credit: Jordi Escofet Miró. Cosmic Research is glad to announce its brand new sponsorship agreement with Irideon. 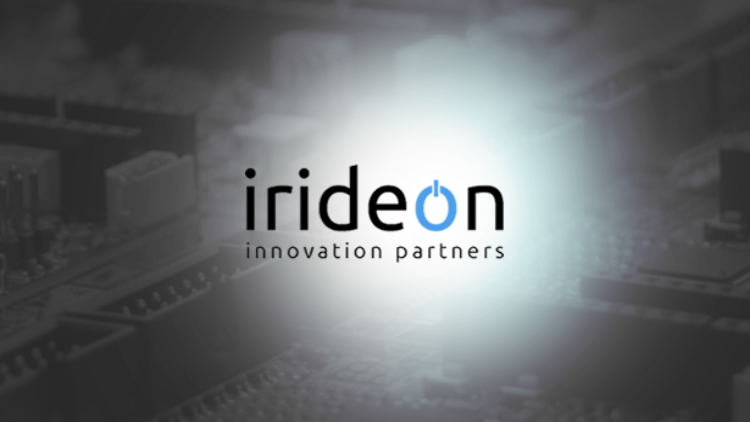 Irideon provides engineering support to companies and research organizations in the development of new products, services, and IPR. Their services include feasibility assessment, electronic design and software development, prototyping and contract manufacture. They also provide Internet of Things solutions based on Senscape® – a modular, standards-based development environment for IoT applications. Thanks to this agreement, Cosmic Research will gain access to the Senscape platform, compiled libraries, software and professional help. Plus, a team member will become an intern working at Irideon. We are public! Cosmic Research has officially been announced to the general public . 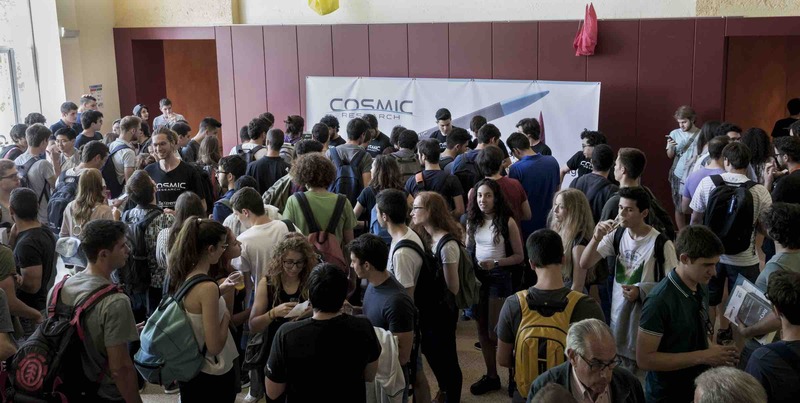 During the event held the 17th of may 2017 in UPC campus Terrassa main building, the TR5, more than 300 attendees made for an incredible audience that listened to the presentation amazed about what Cosmic research aims to achieve. The attendees also got first hand details on what Cosmic had done to that moment, not only through the words of the speakers but also thanks to an incredible video on Cosmic latest rocket: Resnik. Despite its short length of 15 minutes, the event synthesised every bit of information about Resnik while staying didactical and entertaining. 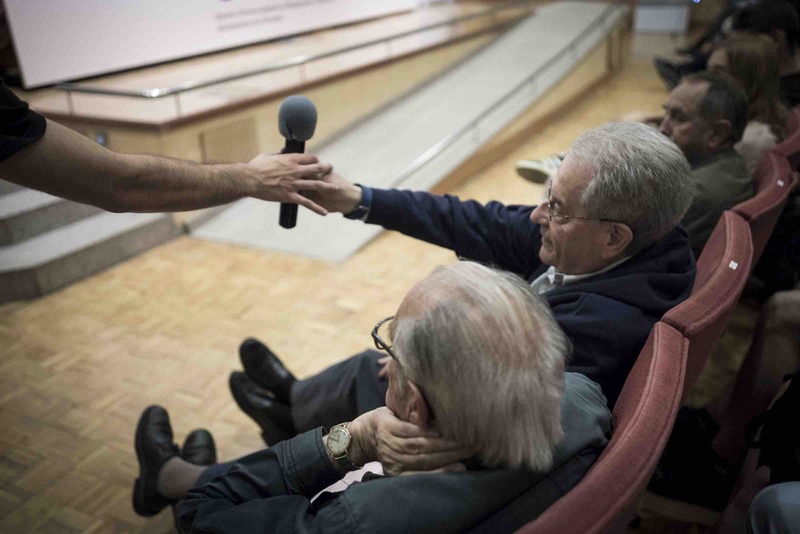 After the presentation, the audience bombarded the team with questions about the project. The team raffled a GoPro to thank the audience, congratulations to Arnau Portero for winning that GoPro! After the event, Cosmic held a brunch outside the conference hall. The attendees enjoyed superb cava and canapés thanks to Cosmic latest Sponsor, Freixenet. 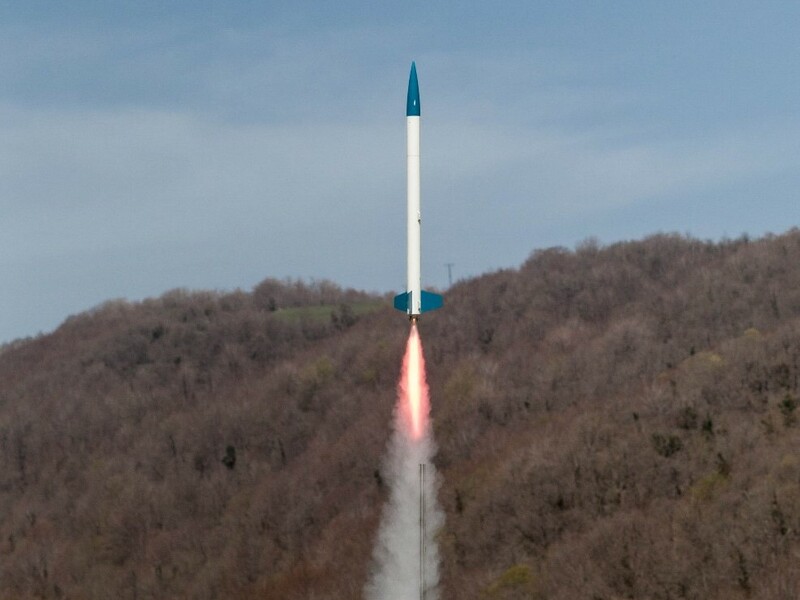 After months of arduous work, we are thrilled to announce that Cosmic Research has successfully tested its first completely in-house designed and manufactured Rocket, Resnik. Despite having some issues with our real-time bi-directional communication telemetry system, Resnik effortlessly achieved its goal hight of 2 Km over its launch site in Alcolea de Cinca, Aragon, Spain. Its motor, our KN-Epoxy resin based solid motor, Acrux, provided the thrust needed to get Resnik to Mach 0.8 , a quasi-transonic speed calculated to push Resnik’s capabilities while maintaining a conservative environment to ensure Resnik’s successful flight. This flight also served as a test ground in which many brand new subsystems where tried for the first time, such as its telemetry systems or our ground Control Software. View of Resnik at liftoff from a rugged camera setup surrounding the launch site. The event was fully covered and filmed by a dedicated filming crew. Professional grade drones where used. Cosmic Research is thrilled to announce its brand new partnership with the Barcelona-based company ALBEDO Telecom. ALBEDO Telecom is Grupo ALBEDO’s division of electronic components and modules. Their headquarters are located in the heart of Barcelona, the tech district, near the city center. They offer you their great experience in electronics to improve your supply processes. At the same time their cohesion with the rest of divisions inside their group allows them to ensure that they can also support you through every stage of design. We are really thankful to Grupo ALBEDO for trusting Cosmic Research and offering their helpful advice on everything related to our telemetry system. Our team has gained some invaluable experience working with such committed professionals. Cosmic Research is thrilled to announce its brand new partnership with the Terrassa-based company FABLAB Terrassa. The dream of having a digital manufacturing laboratory in Terrassa is already a reality with FabLab Terrassa. We make available to any citizen (students, makers, startups, university students, entrepreneurs, etc.) digital manufacturing tools that allow to experiment and develop projects: 3d printers, laser cutters, CNC milling machines, electronics equipment, etc. We are currently experiencing a real technological revolution that involves a paradigm shift in the way we approach manufacturing. Thanks to new technologies today we can realize projects that years ago would not have come to materialize due to the technical and economic difficulties involved in producing on a small scale. From the FabLab Terrassa we want to bring all this technology to citizens, creating a space open to anyone with ideas and desire to share and learn. FabLab Terrassa wants to be an incubator of entrepreneurs providing the right ecosystem for the gestation and development of ideas, and supporting any project developed in the FabLab. FabLab Terrassa is also a space for dissemination of all this new technology, and for this reason we will organize workshops, talks and training courses aimed at individuals from different fields and ages, and that will address various topics around digital manufacturing, application development OpenSource, the global movement towards the Smart Cities, Industry 4.0 and generation of the entrepreneurial culture. We are deeply thankful to Fablab Terrassa for not only trusting but also backing Cosmic Research, becoming our main solution for pub machining and 3D printing. Cosmic Research is proud to announce its new partnership with the Swedish company Textreme. TeXtreme Spread Tow reinforcements is the ultimate choice for making ultra light composites. TeXtreme Technology is flexible and tow-size independent which enables development of optimized reinforcement solutions tailor-made for specific application needs. Utilization of TeXtreme Spread Tow carbon fabrics and carbon UD tapes by manufacturers of advanced aerospace, industrial and sports products confirms that 20-30 % lighter composite parts can be produced with improved mechanical properties and superior surface smoothness. We are deeply thankful to Oxeon and Textreme for not only trusting but also backing Cosmic Research, becoming our main composites provider. Textreme Carbon fiver makes for a perfect solution fulfilling the needs that manufacturing our advanced airframes require.